Active Fin Stabilizers Models 162, 174, 252, 254 & 302 Roll Reduction While Cruising The industry standard for superior performance, quality, reliability, long‐term support and overall value. With more systems in service than all other brands combined, Naiad’s product designs are a refined evolution earned from real‐life experience, analysis, and constant development. 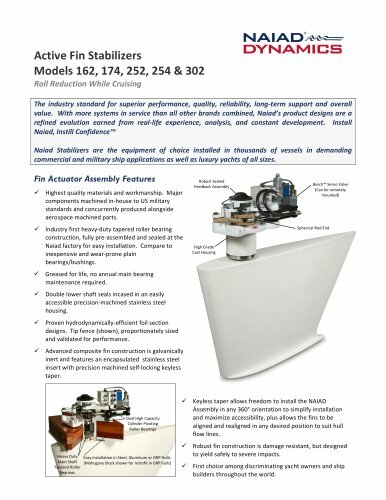 Install Naiad, Instill Confidence™ Naiad Stabilizers are the equipment of choice installed in thousands of vessels in demanding commercial and military ship applications as well as luxury yachts of all sizes. Fin Actuator Assembly Features Highest quality materials and workmanship. Major components machined in‐house to US military standards and concurrently produced alongside aerospace machined parts. Industry first heavy‐duty tapered roller bearing construction, fully pre‐assembled and sealed at the Naiad factory for easy installation. Compare to inexpensive and wear‐prone plain bearings/bushings. Robust Sealed Feedback Assembly Bosch™ Servo Valve (Can be remotely mounted) Spherical Rod End High Grade Cast Housing Greased for life, no annual main bearing maintenance required. Double lower shaft seals incased in an easily accessible precision‐machined stainless steel housing. Proven hydrodynamically‐efficient foil section designs. Tip fence (shown), proportionately sized and validated for performance. Advanced composite fin construction is galvanically inert and features an encapsulated stainless steel insert with precision machined self‐locking keyless taper. Dual High Capacity Cylinder Pivoting Roller Bearings Heavy Duty Easy installation in Steel, Aluminum or GRP Hulls. Main Shaft (Mahogany block shown for retrofit in GRP hulls) Tapered Roller Bearings Keyless taper allows freedom to install the NAIAD Assembly in any 360° orientation to simplify installation and maximize accessibility, plus allows the fins to be aligned and realigned in any desired position to suit hull flow lines. Robust fin construction is damage resistant, but designed to yield safely to severe impacts. First choice among discriminating yacht owners and ship builders throughout the world.